A period drama that peels one layer of mystique away from the British Royal Family, The King's Speech is a captivating, multi-dimensional period piece, and easily among the best films of 2010. It's 1925, and Albert, the Duke of York (Colin Firth), is second in line to the British throne. But Albert suffers from a terrible stammer, and embarrasses himself and the nation with every attempted speech. 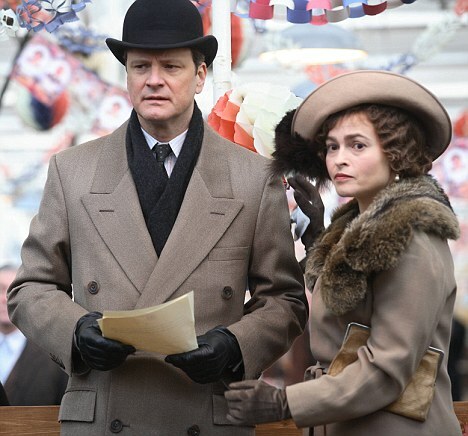 With no traditional doctors able to help, Albert's wife Elizabeth (Helena Bonham Carter) seeks the help of speech therapist Lionel Logue (Geoffrey Rush). An Australian with unconventional methods, Logue agrees to treat Albert, but Albert has deep reservations and insists that the treatment focus only on speech mechanics, and not the causes of the stammer. 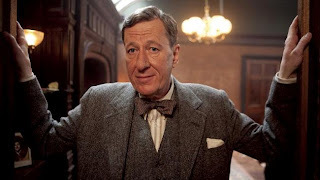 Albert's father King George V eventually passes away; Albert's brother Edward (Guy Pearce) assumes the throne, but is embroiled in a scandal with divorcee Wallis Simpson. With Albert suddenly much more likely to become King, he needs Lionel's help more than ever, and the two start to delve into the psychological reasons for Albert's stammer. But they have a serious falling-out when Lionel appears to push Albert to prematurely think of himself as a King, colliding with Albert's feelings of loyalty to his brother. Edward does abdicate; and Albert is indeed King. He again turns to Lionel for help, and this time the speeches that Albert needs to deliver are not meaningless royal engagements but the words of the leader of the world's greatest Empire. As war flares across Europe and the menace of Nazi Germany needs to be confronted, Lionel guides Albert, now King George VI, as he delivers his first speech of the war, preparing his people and his Empire for the long struggle that lays ahead. 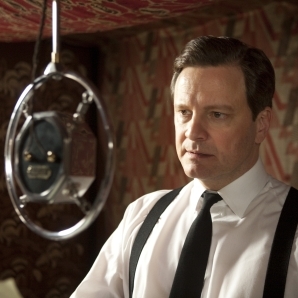 The King's Speech gently but deeply probes several intricate themes. A loveless childhood, stern paternal expectations, and a domineering older brother are not unexpectedly revealed to be the cause of Albert's impediment. The Royal Family only amplified what was the expected method of treating British children in the early 20th century, and the movie asks at what price was the legendary British stiff upper lip earned. The non-existent opportunities for the Royals to interact with their subjects is another thread running through the movie. How can the Royals be the symbols for people they never talk to? Most interesting is the role of Albert's wife Elizabeth (later the Queen Mother). She is portrayed as both strong-willed yet kind; determined yet respectful; patient yet persistent; supportive of her husband as he is, yet willing to help him in any way possible; majestically royal yet able to communicate with commoners. Helena Bonham Carter is superb in portraying the emergence of the modern woman, and The King's Speech wholeheartedly agrees that behind every great man is a much greater woman. Both Colin Firth and Geoffrey Rush deliver memorable performances. Firth as the stammering Albert, Duke of York and later King George VI is magnificent, carrying in his face the shame of the stammer, the pride of the Royals, the agony of a miserable childhood, and at the end the expectations of a nation at war. Rush has a relatively simpler, steadier and sometimes comic role: the Australian speech therapist with unconventional treatments and unshakable belief in his approach, even in the face of royal, religious, and academic scrutiny and doubt. In their scenes together, Firth and Rush capture the stages of a slowly emerging friendship that bridges an enormous gulf in status and wealth, and grows to be strong enough to survive serious mis-steps and doubts. Director Tom Hooper follows up the excellent The Damned United (2009) by recreating an even earlier era: the Britain of the 1920s and 1930s comes to life in The King's Speech, Hooper surrounding his actors with plenty of fog, early 20th century streetscapes, and royal lavishness. The film looks as good as the performances deserve. The King's Speech is ultimately a tribute to the power of good intentions to overcome the significant damage caused by past failures, and the message of optimism that lies within hard-earned friendship is refreshingly daring.